Sorry for the lack of posts in the last week. I was suddenly struck with some sort of winter bug and haven’t been able to do much of anything. However I am finally back on the mend, luckily just in time for the holidays. Although I haven’t been able to eat much, this simple soup has been on the menu the last couple of days since I finally started feeling better. 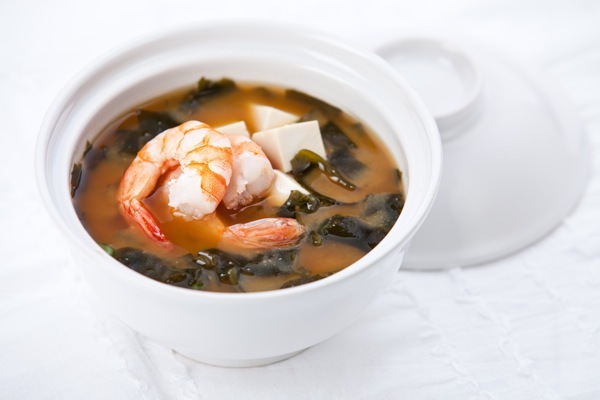 If you like miso soup, this is a great version with shrimp, tofu, and spinach. Add the broth, ginger, chili paste, and soy sauce to a large pot. Bring to a simmer over medium high heat. In a small bowl whisk the miso with 1/2 cup hot broth. Add the mixed miso into the pan. Bring to a boil and add the shrimp, spinach, tofu, and green onions. Cook for about 5 minutes or until shrimp is cooked through.